You are here: Home / Beverages / Family Friendly Drinks / Happy Independence Day Dominican Republic! Today, February 27th, the Dominican Republic celebrates its independence from Haiti. As you know, both countries share the same island, with Haiti on the far left taking up 1/3 of the island. In 1844, the three founding fathers of the Dominican Republic, Juan Pablo Duarte, Ramon Matias Mella, and Francisco del Rosario Sanchez, liberated the country from Haiti’s hold. A few months later that same year, the Dominican constitution was adopted and modeled after the constitution of the United States. Even though decades filled with tyranny, dictatorships, and economic difficulties followed, it was a proud moment, a moment when Dominicans were free. The current state of the Dominican Republic is still filled with economic trials, political nastiness, and extreme poverty. My home island is still a developing nation, one that struggles on a daily basis with not having enough to eat; a country where children in the rural areas need to bring their own chairs to school; a country with leaders that only care for their own allowances and not those who need it the most. And still, we have hope. Dominicans are a hopeful bunch that do not give up – never, ever, ever. And even thought we’re lead by dishonest leaders, we stay honest ourselves. The students strive for a better future, the workforce kills itself every day trying to make ends meet. Oh, and we’re happy. No matter what Dominicans are going through, you’ll see a smile on our faces. Not only will a Dominican always have a smile on their face, but “Los Dominicanos SIEMPRE tienen dinero para el romo”, meaning Dominicans ALWAYS have money for their rum. We can be in the worse possible economy, with no spare change but will always find those extra pesos for our Brugal. This drink was inspired by my island, laced with the help from Rose Royal‘s line of simple syrups, specifically their Tamarind Simple Syrup. It’s tangy, sweet, and tart flavor reminded me of my grandmother’s tamarind tree, that when in season, we’d shake and watch the plump tamarind pods drop on our heads and into our hands. Broken open, tamarind pods aren’t very pretty but Royal Rose has extracted the gorgeous flavor of natural tamarind and made it into a translucent liquid that’s paired perfectly with both Brugal Siglo de Oro (not available in the US yet), as well as with the Brugal Extra Dry (found in most liquor stores in the US). The perfect way to celebrate the Dominican Republic, with its most popular rum, Brugal, and one of its favorite fruits, Tamarind. Pour Coca-Cola and Brugal Rum into champagne flutes. Stir in Tamarind syrup and finish with lemon zest strips. Brugal Rum: Ask your local liquor store to carry it or purchase it online. You can find Brugal Rum 1888 online for when you’re feeling special but for every day drinking, I recommend grabbing a bottle of the Brugal Extra Dry for your local store! 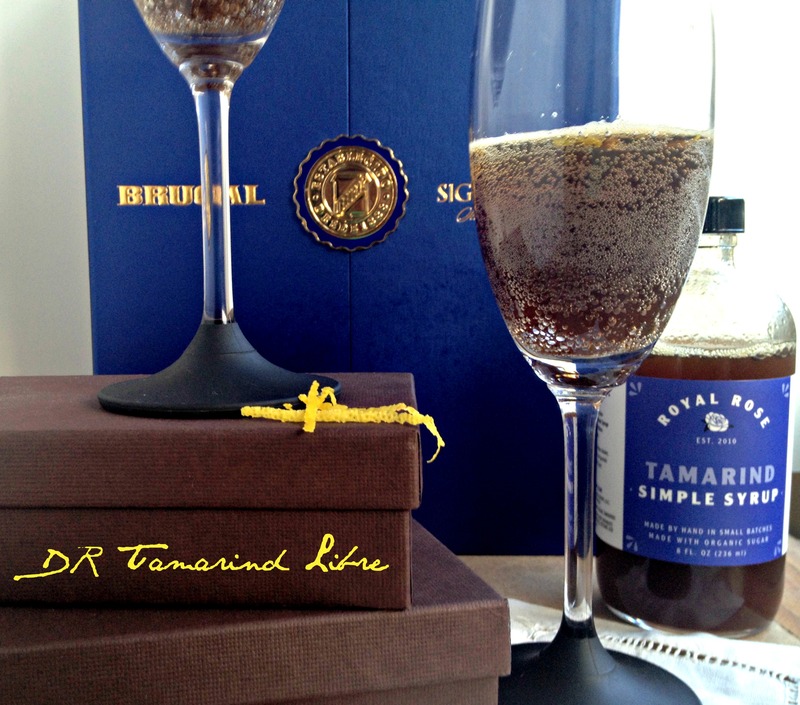 Royal Rose: Grab a bottle of the Tamarind Syrup in their online shop. Treat yourself to their Three Chiles Syrup.